Precious coral or red coral is the common name given to corallium rubrum and corallium Japonicum and some other species of marine coral. Coral is not a mined stone or mineral, but an organic gemstone, along with the pearl. Red coral gemstone also known as Praval or Moonga, according to Vedic astrology, is the primary gem for Mars or Mangal. The ascendants that benefits the most for wearing a red coral gemstone are Scorpio, Aries, Cancer, Sagittarius, Leo and Pisces. 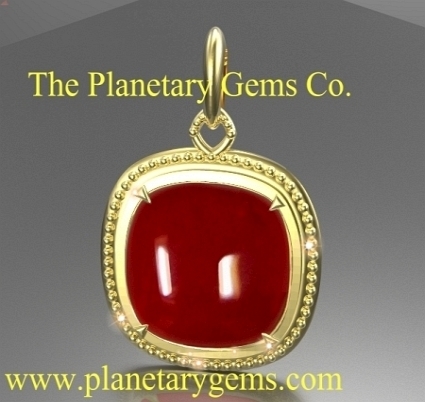 Red coral cosmic color is yellow, which is related to blood, bone marrow, lymph nodes, and the head. Wearing red coral may provide relief and protection from diseases in those parts of the body. The planet Mars is under the Earth element. Red coral purifies the blood and helps in the eruptions of the face, acne, boils, skin ailments, wounds, cuts, recovery from surgery, and injuries. It increases sexual desire, especially in men. Wearing a red coral is beneficial in many instances: - To boost courage, energy, confidence and leadership. - To insures victory over enemies and adversaries. - To eliminate fear and bad dreams. - To avoid violence and accidents. - To defeat mental depression. - To protect women from widowhood. - To support marital life. - To protect from evil eye, black magic and witchcraft. - To get luck and support of nature, if you were born on the 9th, 18th or 27th of each month. Red coral jewelry needs special care. A soft and porous gem, coral scratches and abrades easily. Chlorine, alcohol, ammonia, nail polish remover, and other chemicals can easily damage this gemstone. Remove coral rings when washing and moisturizing your hands and your pendants when taking baths, showering or swimming. Avoid exposing your coral to extreme temperatures. Store your coral separately from other gemstones, as coral is softer than others and could scratch easily. To clean your coral, buff gently with a fine wool or silk cloth your red coral gemstone. Do not be shy. Buff it well. When there is black deposits in between the coral gem and the metal, use a gentle cleaning, jewelry solutions.